We have been focusing quite a bit on the academic scandals at North Carolina and Syracuse quite a bit recently, but the one that is reported to to have occurred at Southern Mississippi might lead to more immediate repercussions. According to Jason King, current Tennessee coach Donnie Tyndall is alleged to have used a scheme where “Prop 48” recruits were reimbursed for tuition, living expenses, and other fees prior to qualifying for scholarships. At issue is the way these recruits were reimbursed. As Gary Parrish points out it would be relatively easy for a program to pull something similar off, but it would require more subtlety. While potential NCAA sanctions against Southern Mississippi are obviously a concern, we are almost more interested in what will happen at Tennessee where they hired Tyndall in the wake of Cuonzo Martin’s departure and are still in the shadow of Bruce Pearl’s NCAA violations. We wouldn’t put it on the level of Rutgers’ inability to vet candidates, but it might not be that far off. If you are a regular reader of the Morning Five, you are already somewhat familiar with our opinion of the graduate transfer waiver. The rule essentially allows a player who completes an undergraduate degree with eligibility remaining to transfer to another institution without having to sit out a year as long as they are enrolling in a graduate degree program that is not available at their previous school. The NCAA decided to look into how often those individuals actually complete the degree and the numbers are not pretty. Of the graduate student transfers they were able to track between 2011 and 2012, only 32% of men’s basketball players graduated from those programs and 59% withdrew as soon as their eligibility expired. We would be interested in seeing more details on this, but these statistics add ammunition to those who question the true intent behind many of these graduate student transfers. This is not to say that the waiver should be eliminated, but that schools and coaches who claim to oppose it should probably take a better look at the apparent intents of these transfers if they want to keep talking about being educational institutions. 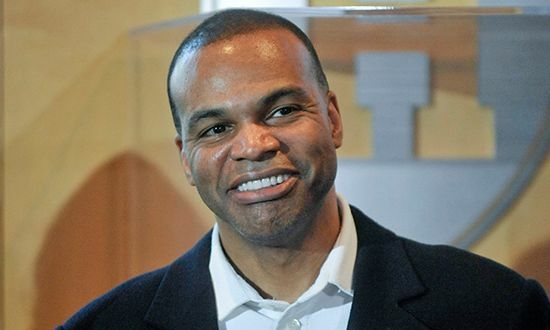 Many consider Ivy League sports archaic, but few would consider their rules as being detrimental to education. That is except in the case of Columbia forward Alex Rosenberg, who will miss the upcoming season after suffering a Jones fracture in his right foot and withdrew from school this year due to an Ivy League rule that makes it essentially impossible to get a medical redshirt. On some level we understand the theory that the student-athlete should be there for school first and staying a fifth year just to play basketball seems to be a fairly trivial thing, but in a situation like this it is actually hindering his educational experience. On the bright side, it will mean that Columbia should get Rosenberg, who was a first-team All-Ivy selection last season while averaging 16 points per game on 43 percent from 3-point range, for the full 2015-16 season rather than just part of this season at most. Given the way that the Ivy League awards its automatic bid–regular season champ–this solution might work out for the best for Columbia. We can always count on the NCAA to make rulings much more complex than they need to be. Yesterday, Wisconsin put out a press release saying that forward Duje Dukan had regained a year of eligibility and would be able to play this season. As Eric Clark points out, the issue is more complex than that as Dukan was denied a medical redshirt for mononucleosis during the 2012-13 season, but played in a secret scrimmage and an exhibition game that year before shutting down for the season. Although the NCAA is giving Dukan his season back they are saying that he will have to sit out for two games this season (basically two games for every game he played that year with the secret scrimmage apparently not counting toward that total). In the end, Dukan missing games against Northern Kentucky and Chattanooga will not matter in the overall picture for Wisconsin’s season, but it does serve to highlight the absurdity of some of the NCAA’s rules. With the way that everything in sports are being commercialized, we do find it a little interesting that Bill Raftery is just getting around to filing a trademark for some of his (not quite yet) trademark phrases. Raftery is applying for trademarks for the phrases “Onions” and “With a kiss” when used during a sports broadcast or on athletic apparel. Given how well Raftery is associated with those phrases it certainly makes sense for him to cash in and collect a little money for himself and his family going forward. We are a little surprised he didn’t apply for a trademark for “Send it in, Jerome”, but we guess there are not that many situations where you could use that. The Forty Year Cycle – On October 31, the AP made official what many had presumed might happen all summer, as Harvard was revealed as a Top 25 team in the preseason basketball writers’ poll. The Crimson became the first Ivy team since Penn in 1974-75 to crack the AP preseason poll, although for the Quakers that was the last of five consecutive appearances in the preseason rankings. In fact, Penn spent time in the AP poll during eight of the 10 seasons in the 1970s, reaching as high as #2 in 1972 and finishing at #3 in 1971 and 1972 after runs to the NCAA regional finals in each season. 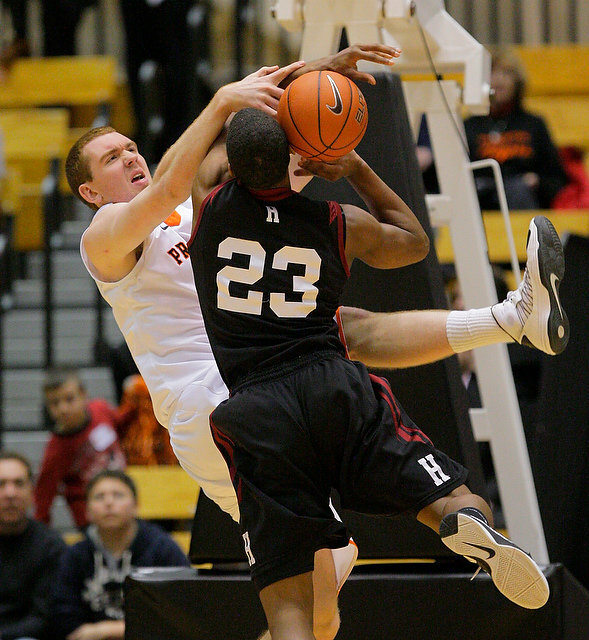 Harvard reached as high as #22 in the AP poll in 2012 before receiving votes but never cracking the list last season. Mourning on the Heights – It started with the departures of guard Meiko Lyles and forward Zach En’Wezoh, both of whom were removed from the roster unexpectedly last month. Lyles would be a loss that would hurt Columbia’s depth, but wouldn’t derail the Lions’ steady march to the top of the league ladder. 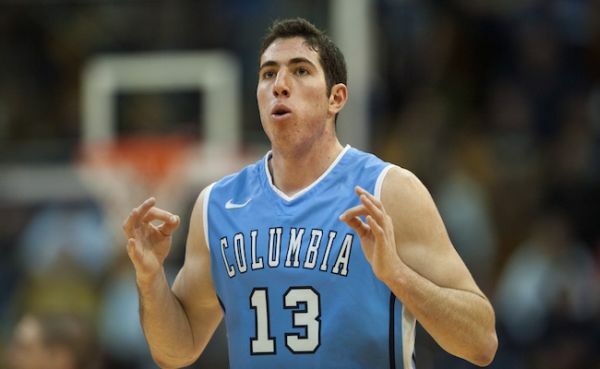 But then, Columbia announced even more stunning news, as All-Ivy forward Alex Rosenberg fractured his foot in practice. That injury is expected to sideline Rosenberg until potentially the start of league play, leaving the 6’7″ forward with a tough decision as to whether to rush back for the 2014-15 campaign or to skip the entire season and apply for a fifth-year waiver. If Rosenberg misses the entire 2014-15 campaign, Columbia will likely struggle to hang on to a spot in the upper division of what will be an incredibly deep and talented Ivy League this season. Preseason Praise – It’s not just Harvard earning the praise of the pundits heading into the 2014-15 campaign. In Dan Hanner and Luke Winn’s #1-#351 Division I rankings, six Ivy teams were ranked #169 or higher, including five in the Top 150. 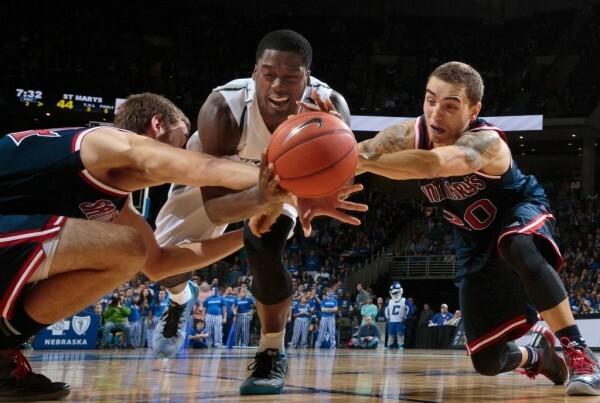 Hanner also rated the Ivy League as the strongest mid-major conference in college basketball (12th best overall). Ken Pomeroy’s preseason ratings were a little more conservative, but still had five Ivies in the top 200 and four rated at #135 or better. Pomeroy rated the league as the 14th best league in the country with an average Pythagorean winning percentage just shy of .500, which would be a record for the Ivies in the Pomeroy era. Leading up to the season, this microsite will preview the best of the Other 26 conferences, region by region. In this installment, we examine the leagues that have a traditional footprint in the Northeastern U.S: the America East, Ivy League, Metro Atlantic, Northeast Conference and Patriot League. Harvard – 2013-14 record: 27-5 (13-1). After failing to reach the NCAA Tournament for 66 straight years, Harvard suddenly finds itself in position to reach a fourth straight Big Dance. 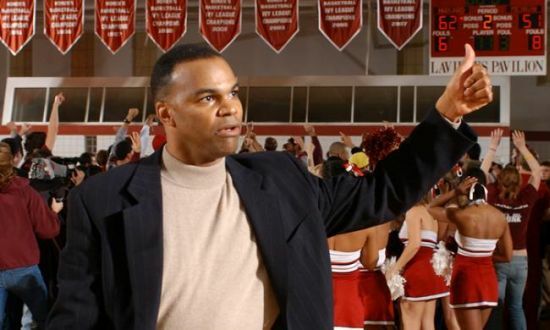 But just as times have changed, so have expectations — not only is Tommy Amaker’s club tabbed to win another Ivy League title, many expect it to do more damage in the postseason. Those lofty expectations can be largely attributed to the return of Siyani Chambers and Wesley Saunders, one of the top backcourt duos in the nation. Chambers is a precocious third-year point guard who has proven himself to be a gifted distributor and quality outside shooter (40.2% 3FG on his career), while Saunders is the team’s top scorer, best perimeter defender and reigning conference Player of the Year. And yet, despite those two, Harvard’s biggest strength might actually be in its frontcourt, which features a deep stable of athletic forwards who should wear down Ivy opponents in the paint. 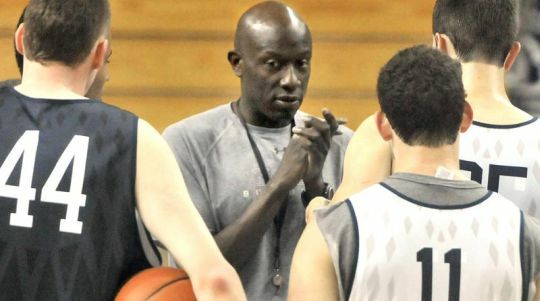 Best among them is Steve Moundou-Missi, a 6’7″ Cameroonian who logged a double-double against Michigan State in the Round of 32 last March. Jonah Travis, Evan Cummins, Kenyatta Smith, Zena Edosomwan — the list of expected contributors seems endless, and if the Crimson can avoid injury to its guards, a sustained presence in the Top 25 is a legitimate possibility. Yale – 2013-14 record: 19-14 (9-5). Yale was the only Ivy League unit to knock off the Crimson last season, so with the majority of its starting five back, the Bulldogs should present the most serious threat to Harvard’s crown. Most crucial among the returnees is Justin Sears, a 6’8″ junior who was something of a statistical machine last season: The forward averaged nearly 17 points and seven rebounds per game, ranked in the top 100 nationally in block rate and drew over seven fouls per 40 minutes. With Javier Duren (13.6 PPG) pacing things in the backcourt and veteran guys like Armani Cotton and Matt Townsend shoring things up down low, Yale fans can expect another top-three Ivy League finish. 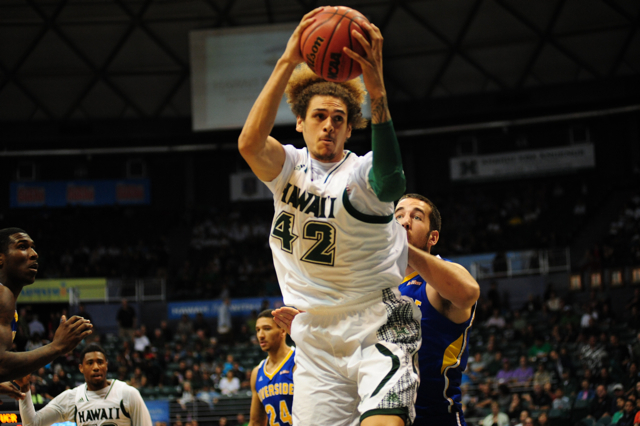 Ivy Race Reset – While 31 automatic bids to the NCAA Tournament will be doled out following the sometimes wild and often thrilling conference tournaments, the remaining one gets decided during the two-month grind known as The 14-Game Tournament. The upside of the Ivy’s unique structure is that (usually) the best team represents the league. The downside is that many teams are effectively eliminated by the middle of February. While Cornell is the only Ivy squad that has been mathematically eliminated from the title chase, four more teams sitting on four or more league losses (Columbia, Penn, Princeton and Dartmouth) would essentially need too much help to fathom. That leaves the co-leaders Harvard and Yale, both at 7-1, and third-place Brown (5-3) as the remaining contenders for the Ivy auto bid. The Crimson remains the odds-on favorite with a +0.22 points per possession margin in league play, well ahead of both Yale (+0.08) and Brown (+0.07). If the Ivy season were 140 games long, that efficiency differential might slowly allow Harvard to separate itself from the pack, but with just six games remaining in The 14-Game Tournament, not nearly enough time remains to assume that the Bulldogs will regress to the mean.